As we take a look back there are awards that need to be handed out. Here is how we saw last week play out. 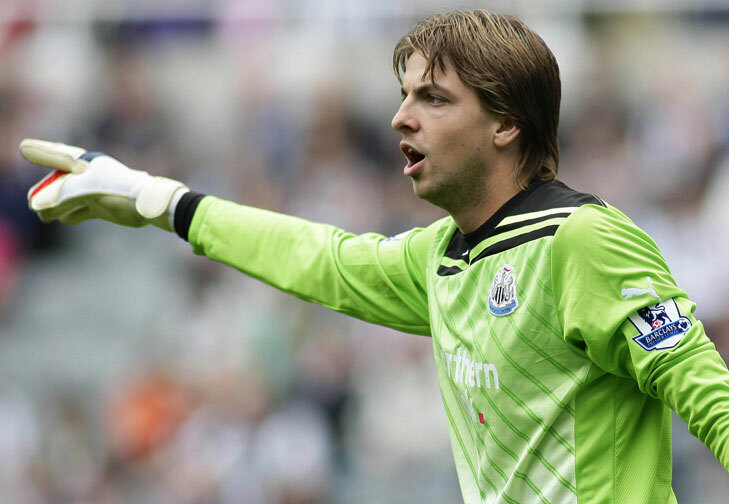 For the 9th time this year Newcastle and their jordie fans are indebted to the sharp display of their Dutch goalkeeper Tim Krul. Krul handled Aston Villa’s immense pressure very well, and his only goal conceded was an unstoppable shot from Robbie Keane at close range. He came up with stops in the waning minutes against Gary Gardner’s header and Emile Heskey’s follow-up attempt. Another player that put out a sensational performance against the Villans was defender Mike Williamson. Time after time he dealt with Villa’s long balls and headed them or passed them to safety. Not only did he deal with the barrage of through balls well, but he also kept poacher Darren Bent off of the score sheet. Though Newcastle didn’t earn a clean sheet, Sunderland defender Michael Turner and his crew did. Turner, along with John O’Shea, dealt with Stoke’s long balls and the snowy elements rather well. Any team that holds Stoke to a clean sheet has to look at their defense with gratitude and, in this case, Turner was the leader of the back four that held Stoke goalless. Leighton Baines is the next man in the squad after the Everton defender helped earn his side a point at Wigan. Baines’ runs and crosses have long been the envy of coaches in the Premier League, and, this time, his cross to Victor Anichebe resulted in the goal that helped the Blues draw level. Throughout the game Baines seemed to be the danger man for Everton and in the end, he was the man who created the game tying goal. When Swansea brought in midfielder Gylfi Sigurdsson from TSG 1899 Hoffenheim, people weren’t expecting much or didn’t even know who he was. However, since his move, the Icelandic international has fit seamlessly into the Welsh side’s quick passing style. Sigurdsson finished Neil Taylor’s teasing cross with a goal and then provided an assist, himself, with a splitting pass to Danny Graham who put the Swans up 2-1. One thing Arséne Wenger did accomplish in the summer transfer window was the purchase of 18 year old stud Alex Oxlade-Chamberlain from Southampton. Chamberlain has provided some great performances lately for the Gunners, and Saturday was no different as he scored his first goals for the club as he netted a brace. He looks to follow the footsteps of fellow Gunner and former Southhampton player, Theo Walcott, as strives to break into the England first team ahead of Euro 2012. The Martin O’Neill era at Sunderland has started remarkably well, and as a fixture in the side since O’Neill’s arrival, young James McClean has impressed when he has been featured. Scoring the only goal of the snowy outing against Stoke, McClean was dangerous throughout and his fearlessness to take on defenders has been a real asset since his breakout into the first team. Not many regard Arsenal midfielder Alex Song as a playmaker, but recently Song has been nothing like a defensive midfielder. His passing has been excellent but his defense-splitting passes have been more impressive. After taking possession from the opponent, Song is always looking for the killer pass to set his team off on a counterattack and against Blackburn, he did it phenomenally. After Leon Best’s unfortunate injury, Alan Pardew’s hand was forced as he brought on new boy Papiss Demba Cissé for the Irishman. Cissé’s excellent left-footed half volley was the highlight of his afternoon, and was no doubt the goal of the weekend. Besides scoring the goal, Cissé was very lively and almost had his first, prior to the volley, when he headed a cross barely over the crossbar. Why have Batman, when you can have Robin? That’s the question among Londoners these days especially Arsenal fans. Robin Van Persie can boast his Premier League high 22 goals in 24 games, and Blackburn’s tattered back line were the latest to feel the wrath of RVP. He grabbed a hat trick against Rovers, and he now hasn’t gone more than one game without a goal since October. The desperation of survival in the Premier League is brutal, and many a coach has been fired for failing to keep their team up. If there’s one thing that Wolves can rely on from their Irish striker Kevin Doyle, it’s his never-say-die attitude and this quality is one thing his teammates should do their utmost to emulate if they want to survive. Doyle’s work rate earned him a goal this week to give his side the win against fellow strugglers QPR, 2-1. Being responsible for subbing in the diligent Doyle, was Wolves’ boss Mick McCarthy. Although he has come under fire recently for his team’s failure to get a win for what seems like forever, McCarthy stuck to his guns and put a team out that will always fight for him, specifically when they were down 1-0 to relegation rivals QPR at Loftus Road. For this, Mick, I commend you. This entry was posted in Home, National, Soccer, Uncategorized and tagged FA Cup, Newcastle, soccer, Tim Krul.